Last summer, I expressed my frustration at the switch from a deluxe softcover edition of Kevin Smith's Green Arrow run to an Absolute Edition. I only found an inexpensive copy of the original Green Arrow: Quiver trade two weeks ago after months of searching practically every comic book store and convention in Florida. The story holds a particular significance for me as it was one of the first all-encompassing DC Universe comics I read during my quest to prepare for Green Lantern: Rebirth. I'm also probably the only person who was drawn to the comic not by the presence of Smith or the return of Oliver Queen, but by Phil Hester's artwork. So how does Quiver hold up all these years later? It's popular to criticize Kevin Smith for his comic book writing skills, and some of his projects (like Batman: The Widening Gyre) do deserve that scorn. But I find that Smith is a skilled writer who needs editorial guidance, and the DC editors were able to reign him in for the most part when writing Green Arrow. Like Robert Kirkman, Smith has a tendency to put far too many words in a single speech bubble. Hester and Ande Parks drew the book such a way that the bubbles tend to not obscure too much of the action. Fans have also given Kevin Smith flack for his treatment of Stanley and his Monster as the basis of the book's villain. Personally, I thought it was in line with what Vertigo did to classic characters that were revamped in Sandman. The violence would be more shocking were it not in a book with more than one bloody battle. The use of Stanley and his Monster is just one piece of the puzzle that Smith creates from strong research into DC continuity. The method used to resurrect Ollie and reset his mind is one of the best retcons I've ever read and one of the rare "perfect" resurrections. For me, a perfect resurrection brings back a character that adds something to the overall universe while not diminishing any replacements. Ollie's return does not come at the expense of his past or his family (the mistreatment of Connor Hawke would happen later with other creative teams). His sacrifice still occurred and his flawed relationships with Black Canary and Arsenal still happened; he just lacks a connection to them until the end. Upon re-reading Quiver, I realized that the best scene Smith uses to explore Ollie's rebirth is the fight with Black Manta (still mutated from Underworld Unleashed). It turns into a team-up with Aquaman, who was the most changed of any of the JLA founders at the time due to his 1990s makeover. Even though he never seemed that close to Ollie when he was alive, his exuberance upon discovering his friend makes it clear to the returned Green Arrow that something is really wrong. For his part, Aquaman ignores that Ollie has severe memory loss and is just happy that someone from the old days is back. In comparison, Wonder Woman is pleased but rather indifferent, Superman is perplexed, and Batman knocks him out to dissect him. It's worth noting that the classic JLA: Tower of Babel story occurred only a few months before the release of the first issue of the revived Green Arrow. Between that and the madness of No Man's Land, Batman is at his most suspicious and paranoid, convinced for quite some time that Ollie is some sort of trick or trap. Instead of Nightwing or Robin, he has Spoiler at his side during his examination of Green Arrow, perhaps because someone who had met Ollie would try to convince Batman to go easier on him [I think Spoiler was in and Robin was out at that moment -- ed.]. Spoiler's presence also works as a coincidental dry run for what would eventually become Mia Dearden's version of Speedy. Mia seems a bit superfluous here, but her arc gets a strong start with her defeat of her pimp. As if all of these characters weren't enough, Etrigan enters the plot halfway through the trade, but his presence is welcome. Because of the big reveal towards the end, Etrigan ends up as one of the book's major villains alongside Batman. Smith puts a lot of effort into Etrigan's rhyming dialogue and even does his best to keep a steady meter. Etrigan's desperate actions drive home the danger of Ollie's existence as a hollow shell that could be taken over. The idea of "hollows" is something that I would've liked to see take root further in the DC universe. Ollie's visit to Heaven to meet his soul shortly thereafter is a really touching moment, allowing him to meet up with Barry Allen once again. Maybe Convergence should've ended with the reveal that ever since his resurrection, Barry has been a possessed hollow . . . Honestly, Convergence and the nostalgia it's stirred is another reason why I'm reviewing this trade. I've spent too much time trying to come up with where DC should start over if it did -- what I call a "save point." Trying to line up the different titles of the era to find a perfect starting point is inexact but Green Arrow: Quiver is usually the center. There's so much promise for Green Arrow that I don't think really was fulfilled in favor of returning to the Arrow/Canary status quo. 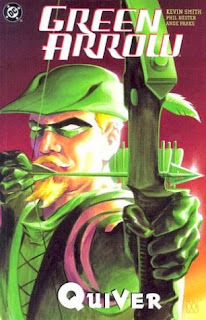 Even with all of the references to Parallax, Final Night and other '90s stories, I think Quiver is a must-read for fans of every Green Arrow iteration, including the television show. Next week, it's a look at the story that inspired one of the most anticipated Secret Wars tie-ins. https://www.flickr.com/photos/61186041@N02/12733949995/ Cross stitch of the cover I made. Quiver was my introduction to comics and has left a big impact. Love it. How did you do it? Do you have a model or something? Awesome, I'm tempted to check this out right now! I understand why people would be wary of Kevin Smith in a comic medium since in his films they are driven by lengthy engaging dialogue. Was very excited when I found that it was re-released again also. I was excitedly waiting on the release of the Deluxe edition of Green Arrow by Kevin Smith collecting the 15 issues, but now both stories have been re-released Quiver and Sounds of Violence are available to buy in paperbacks.